Did you know that you can own more than one Chase Freedom credit card? The Chase Freedom credit card is one of my favorite credit cards. I think it belongs in everyone's wallet, from big spenders to little spenders. The 5x bonus categories can help you earn Chase Ultimate Rewards points at an accelerated rate. Current 5x categories include: Gas Stations, Drugstores, and Starbucks. Other upcoming categories include Restaurants, Movie Theatres, Lowes, gas stations, theme parks, Kohls, Amazon.com, and select department stores. Keeping the Chase Freedom card permanently will increase your AAoA (Average age of accounts), which in turn will help to increase your credit score. This card has a nice, snazzy looking blue sheen to it. And to top it off, this card has no annual fee! The 5x bonus categories is capped at $1,500 worth of spending, meaning you can earn a maximum of 7,500 Ultimate Rewards points ($1,500 x 5 = 7,500). Chase wants people to manually activate each 5x bonus category, since it psychologically encourages individuals to spend more than they actually would in such categories, to try to get the 5x points. Be mindful of this. In my case, I enjoyed the benefits of the 5x rotating categories so much that I decided to convert my barely used Chase Sapphire card into another Chase Freedom card, the Chase Freedom Mastercard. All it took was a quick phone call to Chase and a request to perform a product change from my Chase Sapphire card to a new Chase Freedom Mastercard. I've heard mixed reports about downgrading your Chase Sapphire Preferred card (when your $95 annual fee hits and you don't want to keep that card) into a Chase Freedom card. I've also heard mixed reports about applying for a Chase Freedom card when you already have one. 2. 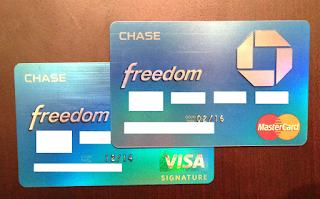 Convert one of your other unused Chase cards into a Chase Freedom Mastercard. Now I can maximize my Chase 5x categories two times. This last month, I have purchased 3 Vanilla Reloads on each of my Chase Freedom cards to load onto my Bluebird account. I spent $503.95 on each Vanilla Reload x 6 = $3023.7. From these purchases, I earned 15,000 Ultimate Rewards points ($500 x 5 x 2 = 15,000). I then used my Bluebird account as an “intermediary account” to pay all my bills including my mortgage payments. I’m looking forward to future 5x category bonuses to come up with creative ways to earn more UR points! You can apply for a Chase Freedom card here.